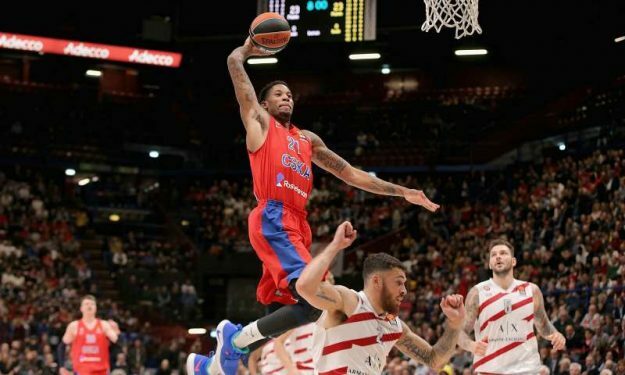 Olimpia Milano “smelled” another big victory for 30 minutes, but CSKA had the last laugh. CSKA Moscow recovered from a 13-point deficit to beat Olimpia Milano on the road 90 – 85 and extend its perfect EuroLeague record to 6-0. It was a game of huge ups and downs for both teams until the final minutes when everything went up for grabs. With the score 80 – 80 and 2:32 remaining, Cory Higgins made the start and then Kyle Hines scored a bucket and delivered a huge block on the other end on Mike James to keep CSKA at a two-possession distance. The “Army Men” preserved an advantage with free throws by Higgins to capture the win. Higgins was the top scorer for CSKA with 23 points. He also notched a game-high 28 PIR. Nando De Colo added 18 points, four assists and four rebounds for the Russian team while Will Clyburn added 14 points. Alec Peters had a key contribution with 10 points, all of them in the last 14 minutes. Milano was up 64 – 51 with two minutes left in the third period until a sequence of mistakes and turnovers allowed CSKA to drop consecutive points and build momentum that led to a 2 – 17 partial score for the 66 – 68. Milano last tied the match with a 3-pointer by James for the 80 – 80 but ultimately paid for giving up the aforementioned lead and thus dropped to 4 – 2. James posted his first career double-double with 12 points (6/19 f.g.) and a career-high 10 assists. He also had six boards but also some wrong decision-making in the last 15 minutes. Vladimir Micov scored a season-high 24 points while Arturas Gudaitis had 16 points and seven boards.